This recipe is a great example how I start out with one idea and eventually end up making something completely different. Fall is starting to set in. In Florida this basically means less humidity, since temps are still in the low 90’s for a few more weeks. Still, I’m ready for fall and wanted to make something that felt like autumn to me. So once I settled on making cookies, I took a standard chocolate cookie recipe and played around with the ingredients. 1. Preheat oven to 375° F. In a small bowl combine flour, salt, and baking soda. Stir together. 2. In a large mixing bowl combine butter, both sugars, and vanilla. Beat together until creamy. 3. Next add eggs one at a time, beating well after each. Beat flour mixture in little by little. 4. Stir walnuts, chocolate, and cranberries into cookie mixture. 5. Line a baking sheet with parchment paper and drop heaping teaspoons of cookie dough onto sheet approx 1.5 inches apart. 6. Bake for 6-8 minutes or until edges turn golden brown, and middle is still pale. Remove from oven and allow to cool. This will give you a soft center cookie. 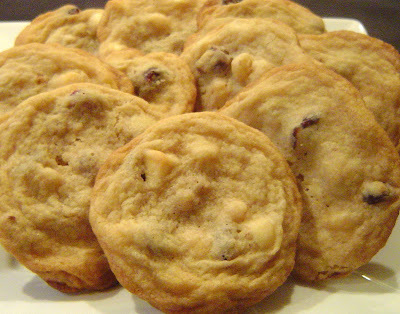 Cook for 1-2 minutes more for a firmer cookie. Thoughts: These cookies are buttery but not too sweet, and the dried cranberries give them a nice little chewy surprise. Originally I only used 1 cup of nuts but that was not enough so I added another half cup to the recipe. You can certainly add more if you like. Brent said these tasted like Christmas, so these would be a great cookie for winter too. We both enjoyed only about a dozen of these cookies; the other 5 dozen were sent to work with Brent were his co-workers for to enjoy them. Cranberries and white chocolate are a match made in heaven. I love the addition of walnuts, too. This looks like such a yummy cookie! I'd love one of those cookies now, they look delicious. Rose, I am so glad to hear that! Thank you so much for letting me know your little ones enjoyed them! Cookies are my favorites of course of all of the kids too. But this one is really unique. It is skinnier and whitey than the other chocolate cookies. Is it better if I can use the white chocolate mix already? Does the other ingredients amount will not be affected? @ Melanie - If you are using a mix, I would follow those directions and then just add the cranberries and walnuts. I *think* this is what you are asking. If not, feel free to email me @ kittenwhisk@yahoo.com and I'll be more than happy to help further. They are paler than nromal cookies because I underbake them a bit so they are soft and chewy, not crunchy. Soft and chewy! Yummy! I should really try this one. Maybe it yummier if I add some chocolate syrup or some cream cheese frosting on the top of the cookies.